Businessman Sudhir Ruparelia appears in court recently. Photo by Raymond Mayanja. KAMPALA–Following months of protracted legal fists, the Commercial Court has Thursday disqualified law firms of MMAKS advocates and AFK Mpanga advocates from representing Bank of Uganda against Businessman Sudhir Ruparelia. This was in a ruling delivered by Commercial Court Registrar Lillian Bucyana on behalf of Justice David Wangututsi. In the ruling, Judge Wangututsi said it would defeat the importance of secrecy because Mr Mpanga and Mr Kanyerezi knew that there existed a substantial relation between the applicant and them. Having earlier been lawyers to Sudhir, the ruling stated that alot of information must have flown between them henceforth conflict of interest may not exist but secrecy may be broken. “Mr. Mpanga negotiated and drafted the Confidential Settlement Agreement. The Settlement Agreement however, developed disagreements. The moment Mpanga drafted the agreement he should have known that this was part of the assignments with the applicant. And therefore his status as a potential witness is known,” the judge held. The duo was thus disqualified from the main suit. Meanwhile, Eric Adriko who represented Masembe informed court that he had instructions to appeal the ruling. He added that a notice of appeal will have been filed in court by the end of today. In September, Sudhir protested the representation of BOU by the two law firms that were initially his lawyers, citing conflict of interest in a case in which he is accused of defrauding Crane bank of close to Shs400 billion. 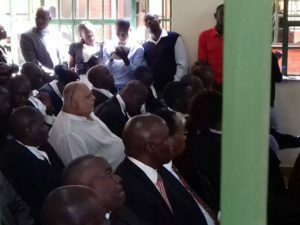 He argued that their presence as BOU lawyers will deny him a fair trial and justice since the two law firms “are in breach of advocate–client relationship because Timothy Masembe Kanyerezi, the managing partner of MMAKS Advocates, and David FK Mpanga, a senior partner in AF Mpanga Advocates represented Crane bank until October 20, 2016, when BOU took over its management and thus the law firms shared confidential information with the central bank”.